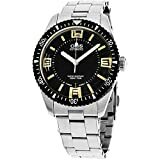 I recommend purchasing the Oris Divers Sixty Five at Amazon and Jomashop. Please consider that purchasing anything through any of the links on this website helps support BladeReviews.com, and keeps the site going. As always, any and all support is greatly appreciated. Thank you very much. Welcome Aaron! This is a great first review. Keep up the good work! Thank you, Patrick. Aaron has a few watch reviews in the pipeline here, and I’m excited that he is going to be contributing reviews. Hey thanks! Really looking forward to contributing more content. I always love the styling of that watch, its pretty close to the perfect vintage sub! Thanks, Thomas! I agree – pretty sweet looking watch! You are incorrect in stating that Oris has always been independent. Although it was originally indepemdent, It was also owned by the Swatch group until a management buyout made it private once again.